You are buying: 1x The Battle of Destiny for Super Famicom. Playstation 2. Playstation 3. THE PHOTO SHOWN IS AN EXAMPLE. YOUR ITEM WILL BE SIMILAR BUT MIGHT NOT MATCH EXACTLY. This item is genuine, original. No Case or Instructions. If you are not happy with it we will work to fix the problem. 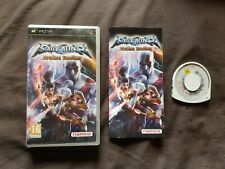 Soulcalibur Broken Destiny PSP Brand new, Sealed. Fighter's Destiny for N64 in acceptable condition. No case, no manual. Fighters Destiny Nintendo 64 N64 Authentic Video Game Cart OEM Retro Fight GOOD! 4.5 out of 5 stars - Fighters Destiny Nintendo 64 N64 Authentic Video Game Cart OEM Retro Fight GOOD! 13 product ratings13 product ratings - Fighters Destiny Nintendo 64 N64 Authentic Video Game Cart OEM Retro Fight GOOD! In Dynasty Warriors 5 Empires, the armies of the kingdom are at your command. The player's ultimate goal is to conquer the 25 regions of Ancient China and build an entire Empire using cunning diplomacy and uncompromising force. I will list above if I tested it and if the Cd has scratches. A lot of disc I get professionally resurfaced ie no scratches. SEE en.wikipedia.org/wiki/NTSC for info. I try to do my best explaining products but make mistakes as we all do. Fighters Destiny Nintendo 64 N64 Authentic Video Game Cart OEM Retro Fight GOOD!. Condition is Good. Shipped with USPS First Class Package. Condition - used in fair condition. Fighters Destiny N64, F-1 World Grand Prix, Virtual pool Game Lot . Condition is Good. Shipped with USPS First Class Package. Will NOT play on PAL / Japan / China / SECAM region code system 4. Condition of label:Front: torn upper left ,Back: good, see pictures. ·No region lock for PlayStation 3. ·I can put up many variety of Japanese goods for sale. This item is Japanese Version.Working only on Japanese Console(NTSC-J). Good clean used condition. Fast free shipping. Nintendo 64 USED Famista　64. Nintendo 64 USED Chopper Attack 64（WILD Choppars）. Nintendo 64 USED Play-by-play powerful pro baseball　6. Nintendo 64 USED Yoshi Story. Nintendo Super Famicom USED Super Bonber Man．　Japan　Import. Fighters Destiny (Nintendo 64, 1997) N64 Authentic OEM Game Cartridge Excellent! The photos are the actual item! 4.5 out of 5 stars - Fighters Destiny (Nintendo 64, 1997) N64 Authentic OEM Game Cartridge Excellent! 13 product ratings13 product ratings - Fighters Destiny (Nintendo 64, 1997) N64 Authentic OEM Game Cartridge Excellent! You are bidding on a copy of Fighter Destiny For Nintendo 64. It was cleaned, tested and works. See item you will receive in photos. Message me with questions Check out my other N64 games! RARE! Fighters Destiny Nintendo 64 N64 Authentic OEM Video Game Retro GREAT! For sale is a pre-owned RARE! I rarely played it as a child. 4.5 out of 5 stars - RARE! Fighters Destiny Nintendo 64 N64 Authentic OEM Video Game Retro GREAT! 13 product ratings13 product ratings - RARE! Fighters Destiny Nintendo 64 N64 Authentic OEM Video Game Retro GREAT! Fighters Destiny. for Nintendo 64. Notes: Tested with Handwriting or Label Tears. Condition: Acceptable. SKU: SD51200. Manufacture: Bandai. Platform: Sony Playstation. Format: NTSC Japan. Release date: 22-Aug-02. Near Mint - Almost as good as new but there is a small issue (slight signs of use, 1 or 2 light mark). Condition:NEW sealed. Fighters Destiny for the N64 (Nintendo 64). FIGHTERS DESTINY. made with love by. We will always go out of our way to source the product you are looking for. You can choose from more than 10 characters and enter the ring in the ultimate hand-to-hand competition. Rather than using a two-out-of-three format, you must score seven points in order to win a match. Defeat the Masters of the Fight in a head-on bout of power and skill. Fighters Destiny demands everything you have, and throws it right back at you in truly amazing 3D action. Prepare to fight every step of the way as you master the moves and unlock the secrets to fulfill your ultimate destiny! History's hidden secret is revealed. During the age known as "Bakumatsu", 135 years ago, chaos rules! We are a team of nine based in a 2,500 sq/ft unit in a gated industrial park in South Manchester, UK. Fighter's Destiny - N64 Nintendo 64 - CART ONLY. NINTENDO 64 FIGHTERS DESTINY. Plataforma Nintendo 64. SPAIN PAL VERSION. BOX AND MANUAL IN SPANISH. Check out our accounts. Formato PAL (estándar de UK). Fighters Destiny. SpielLanguage usually English/German. Pattern picture! Item may differ from the photo. Simple tricks The Konsolenkost-Team wishes you a lot of fun. Item may differ from the photo. Piattaforma Nintendo 64. (without case).